Danish Army Specific: Delivered by the British forces in Germany just after WW II. Historical: The prototype of the Pioneer dates back to 1925. It was developed as a logging and oilfield tractor with the first prototype ready in June 1927. By 1928 Scammell was offering the Pioneer in 6 x 6 and 6 x 4 configuration powered by a 7-litre four cylinder Scammell petrol engine. The company was quick to promote the Pioneer as a military vehicle, but apart from a single 20 ton tank transporter (6 x 4) in 1932 the British Army didn't purchase any in quantity, until starting to take the R100 heavy artillery tractor version in late 1936 (by now looking very different from the original 1927 model). In 1939 with the build up to war production of the recovery tractor (shown above) started along with a 'modernised' tank transporter. The first recovery tractor, designated SV/1S (23 ea) and SV/1T (20 ea) was produced under 4 contracts in 43 examples only, when an up-dated version, the SV/2S was placed into production. The Gardner 6 LW engine, which were used in Scammel´s products from 1933 onwards, also powered Scammell R100 artillery-tractor, Scammell TMRU20/30 tank-transporter and other British trucks like DG6/10 and DG6/12 from Foden. Constant modification enabled the range of LW-engines to stay in front of diesel-engine development for two decades, and it remained in production for 35 years. Besides the 6-cylinder engine the LW-series contained two, four, five and eight cylinder versions. More than 90.000 engines were produced. Approximately 3.500, of which 1.975 were recovery vehicles, had been produced with production ending in 1945. A civilian version continued for a few years called the Scammell 80 toner. 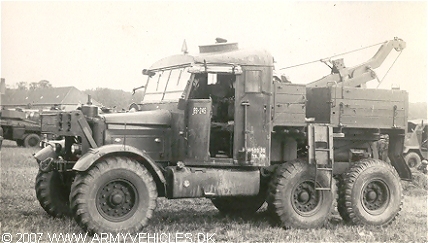 This was intended as a heavy haulage tractor and apart from the larger cab was all most identical to the wartime model. This was eventually replaced by the Constructor. The R100 artillery tractor soldiered on till around 1950 where it was replaced by the Leyland Martian. The recovery version continued into the 1970´s. Length: 6.17 m (243 inches). Width: 2.64 m (104 inches). Weight: 9.740 kg (21.645 lb.). Engine: 6-cylinder Gardner, type 6 LW, 8.369 cm3 (510 cubic inches) displacement. Horsepower: 102 at 1.700 rpm. Electrical system: 24volt starting and charging, 12 volt lighting. Fuel capacity: 245 liter (54 gallons). Range: Approx. 690 km (430 miles). Additional: 7.5 ton winch, and 3 ton Herbert Morris sliding jib. Maximum speed was 24 mph (38 km/h). More information about Scammell trucks are available at Paul's Scammell page.